1. The LENGTH of the conductor. 2. The CROSS SECTIONAL AREA of the conductor. 3. The MATERIAL of which the conductor is made. Therefore the longer the conductor, the more resistance is present and so less current flows. Which is written as	R ∝ 1/A (or R ∝ A-1). The greater the cross sectional area, the more current can flow along the conductor, so the lower the value of the conductor´s resistance. π r2 Where π = 3.142	and r is the radius of the circle. 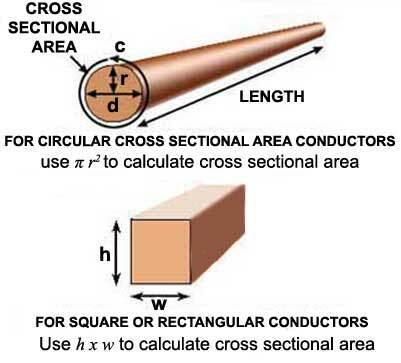 If the cross section of the conductor is square or rectangular, the cross sectional area of the conductor can still be found by simply multiplying the width by the height. Most conductors, found in cables etc. are of course circular in cross section. The Material from which the conductor is made also affects its resistance, by an amount depending on the RESISTIVITY of the material, described in Resistors & Circuits Module 1.4.